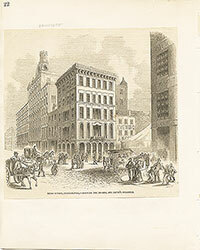 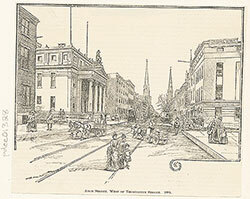 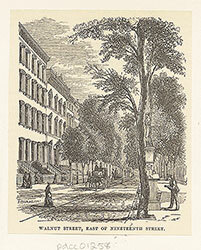 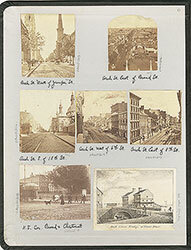 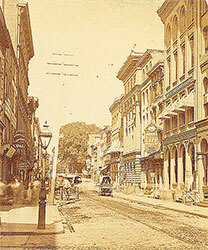 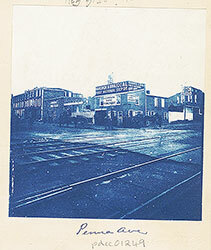 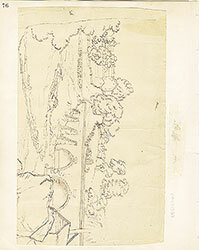 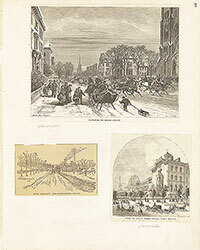 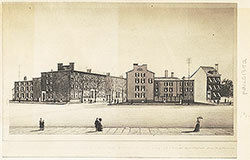 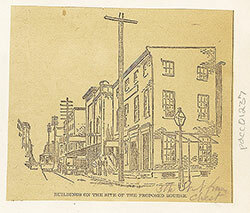 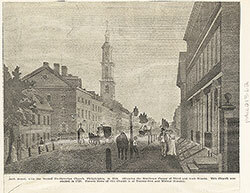 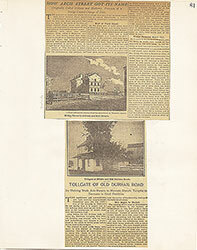 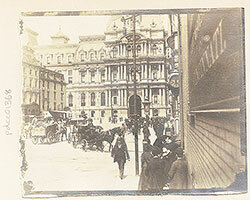 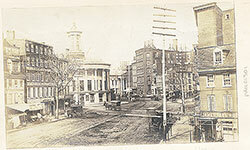 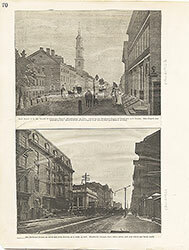 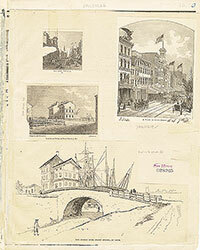 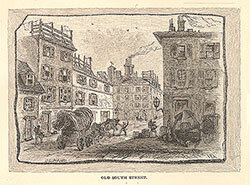 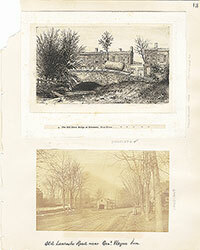 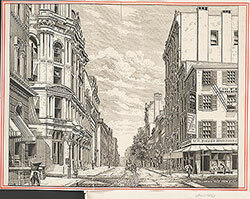 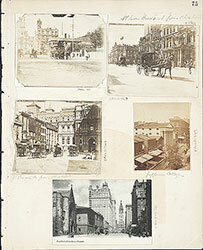 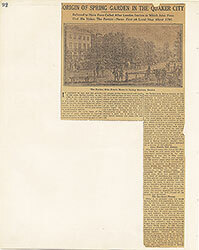 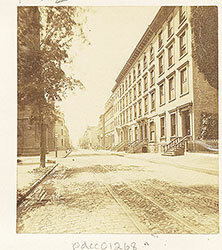 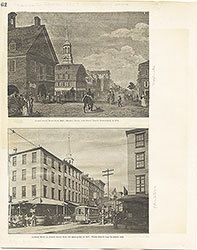 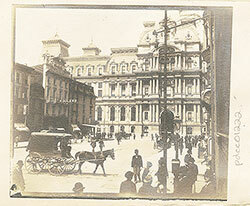 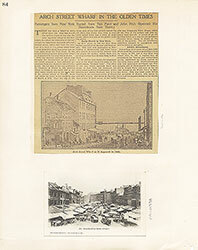 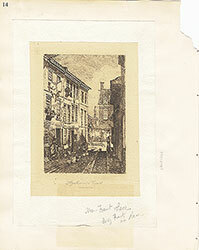 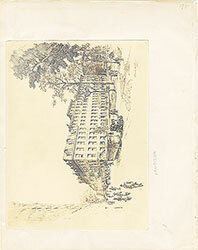 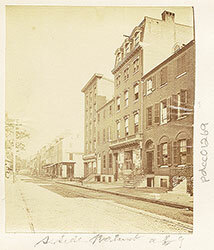 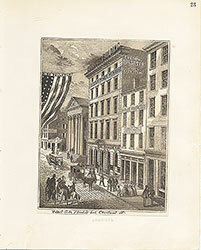 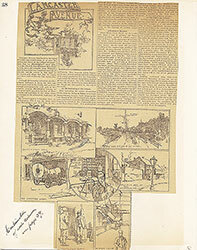 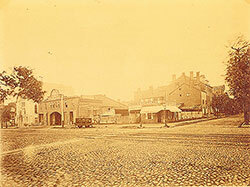 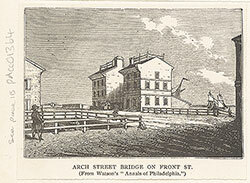 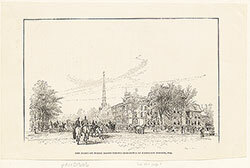 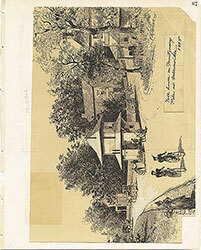 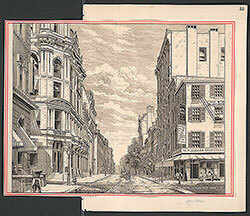 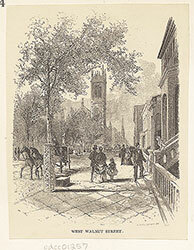 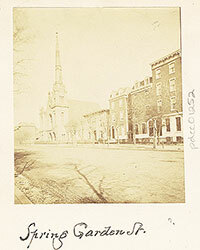 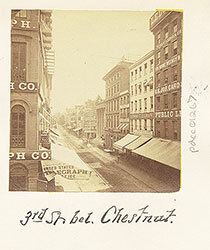 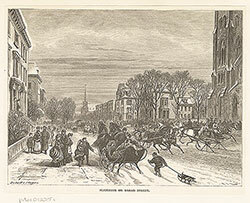 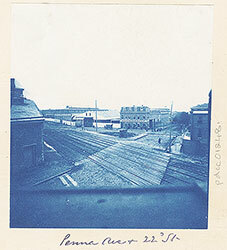 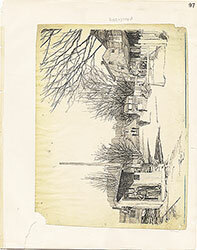 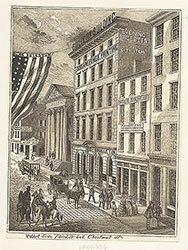 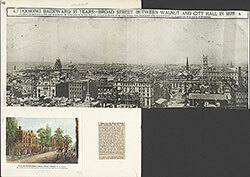 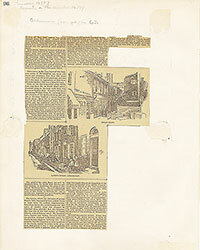 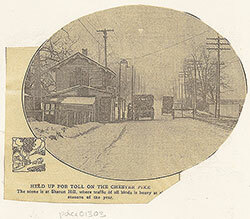 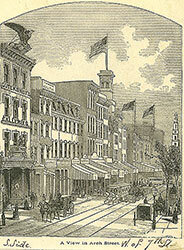 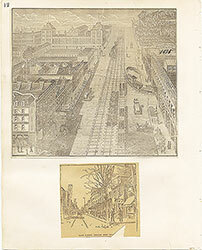 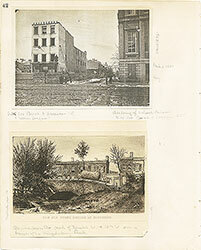 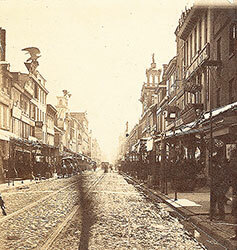 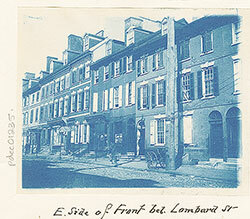 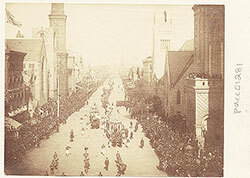 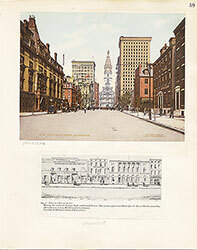 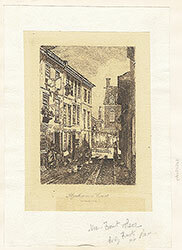 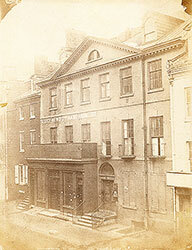 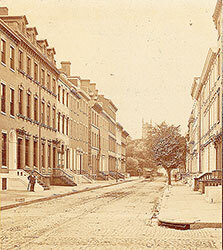 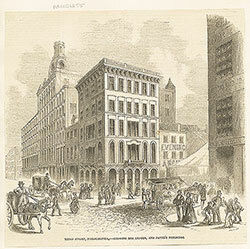 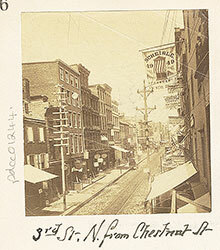 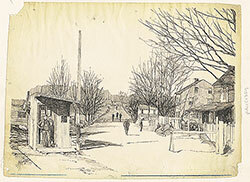 Title: Chestnut Street in 1851. 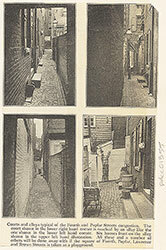 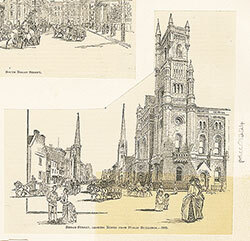 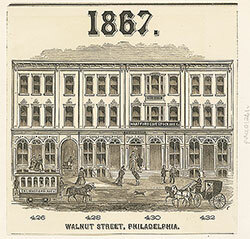 Halftone reproduction of a panoramic business directory depicting a section of Chestnut Street between 6th and 7th Streets. 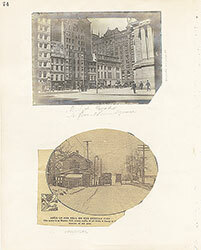 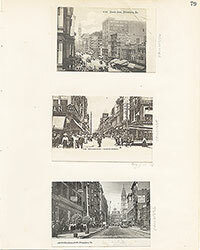 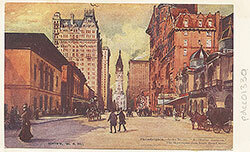 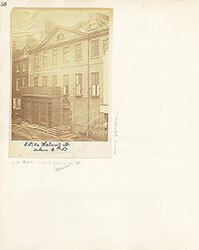 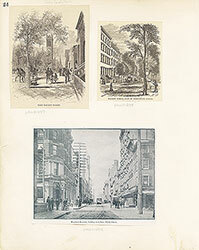 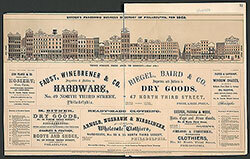 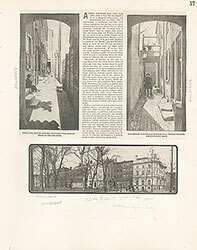 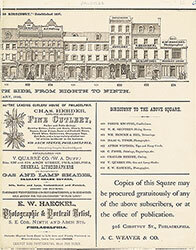 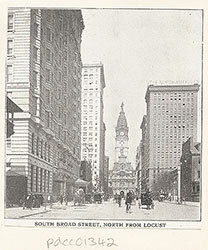 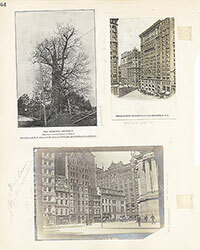 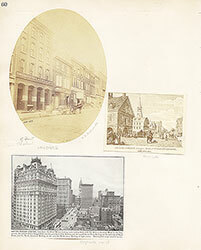 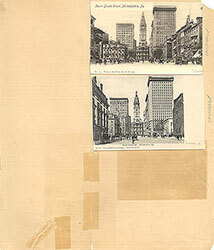 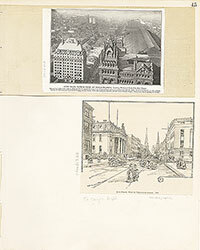 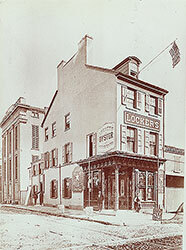 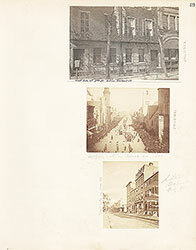 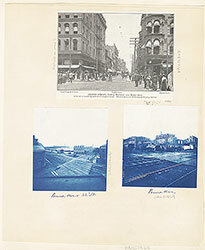 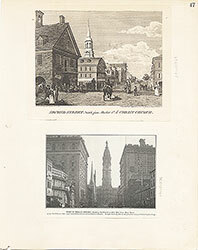 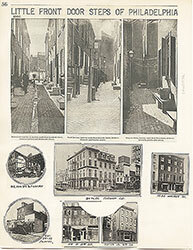 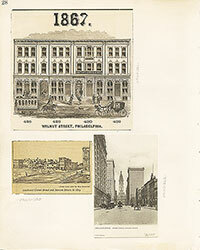 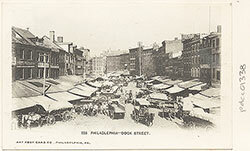 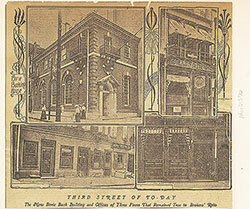 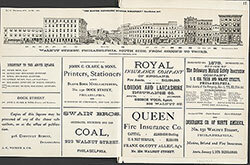 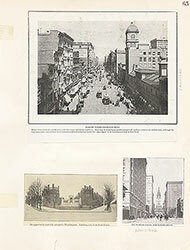 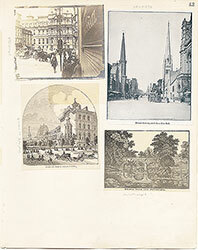 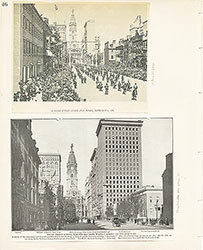 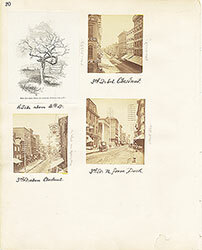 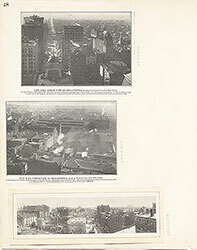 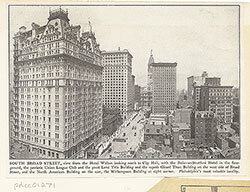 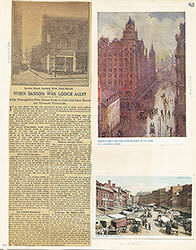 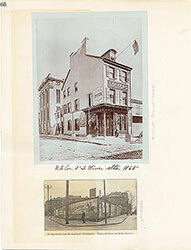 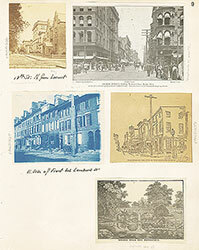 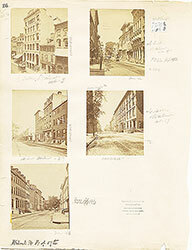 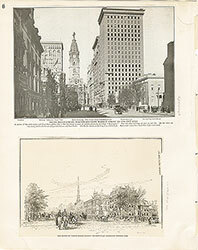 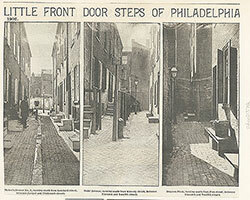 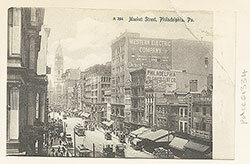 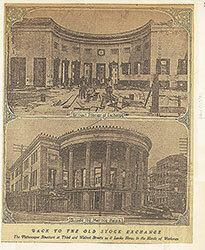 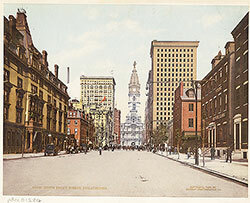 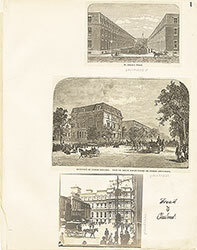 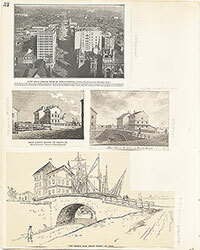 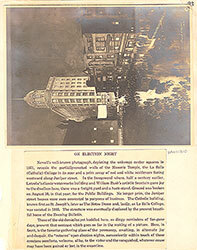 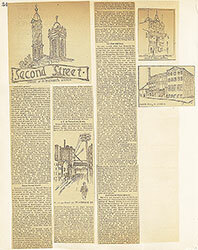 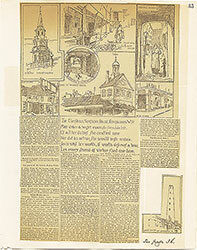 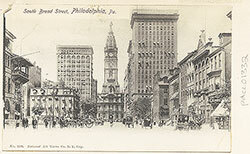 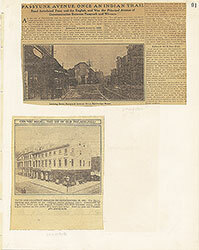 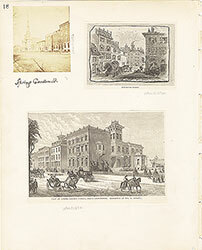 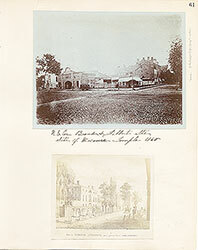 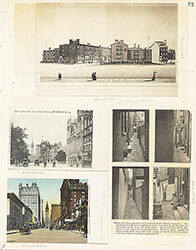 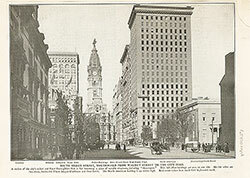 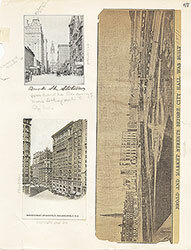 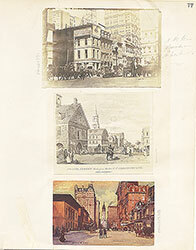 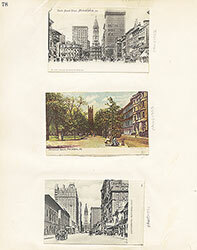 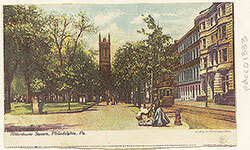 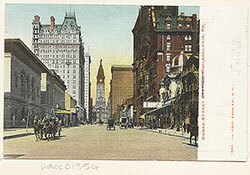 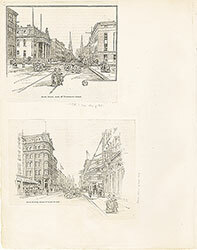 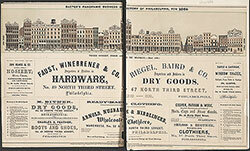 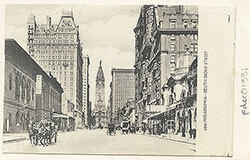 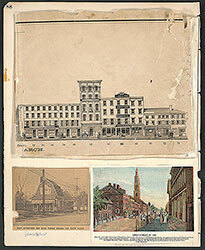 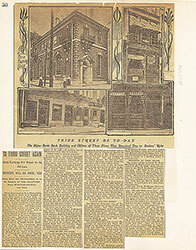 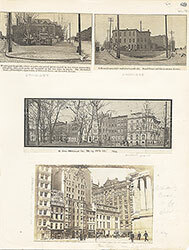 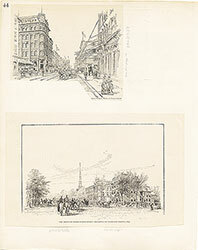 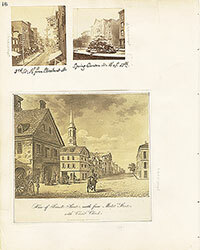 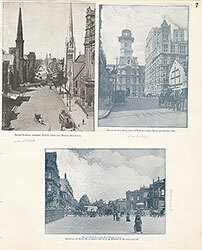 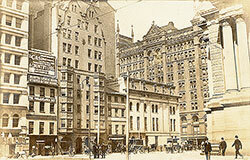 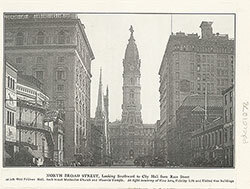 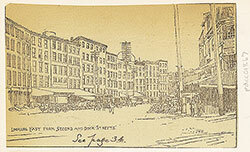 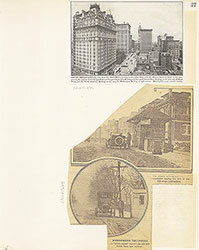 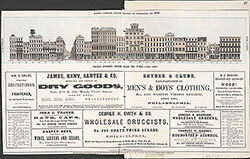 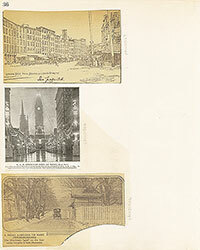 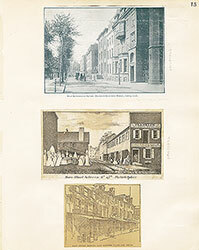 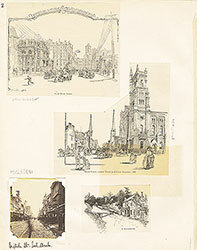 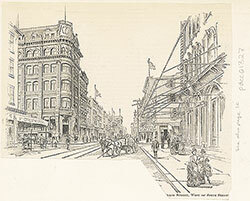 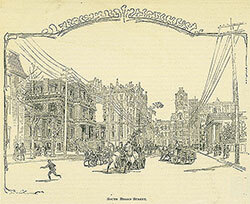 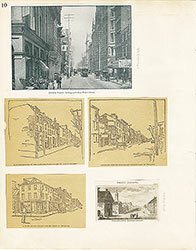 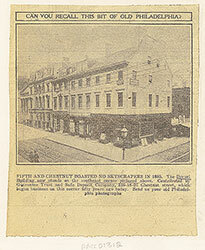 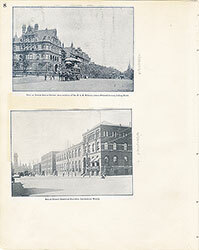 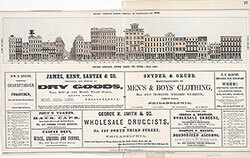 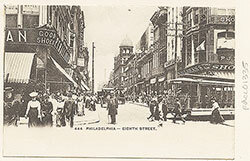 Signs indicate various commercial enterprises: Dr. Jayne's Philadelphia Arcade; Dr. Davidson's Arcade Baths; N.Y. Journal of Fine Arts; Bolivar House; Chestnut Street Theatre; Schenk's Pulmonik Syrup. 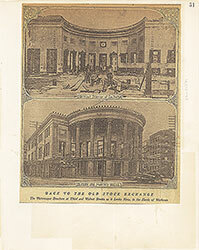 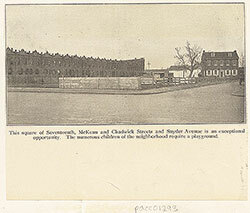 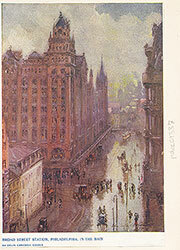 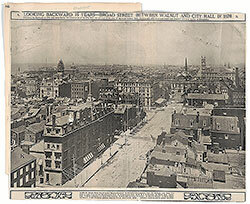 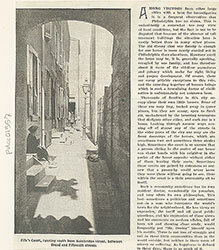 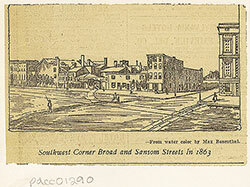 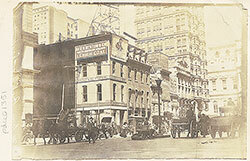 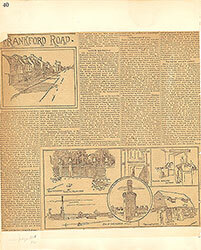 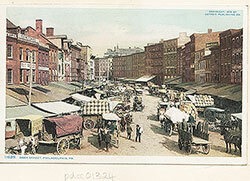 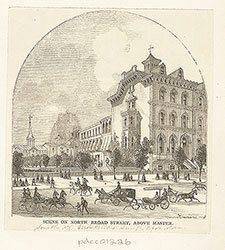 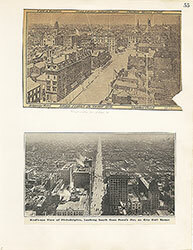 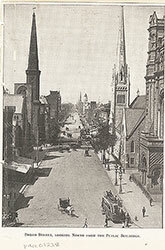 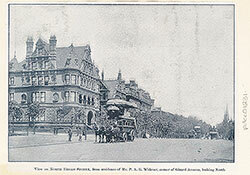 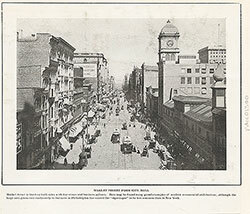 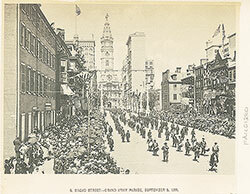 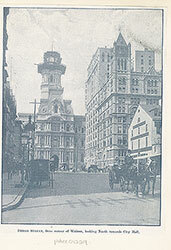 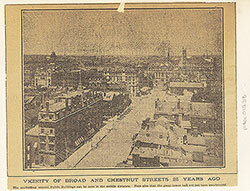 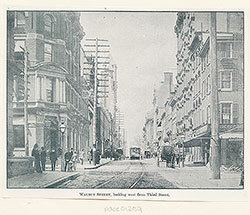 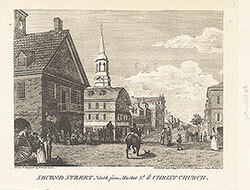 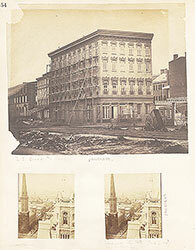 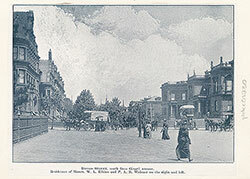 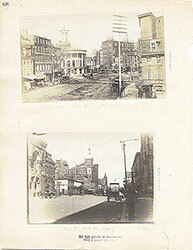 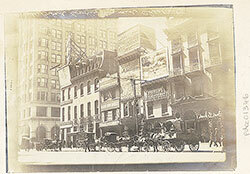 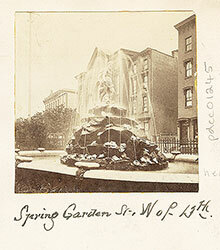 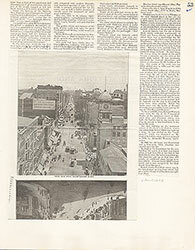 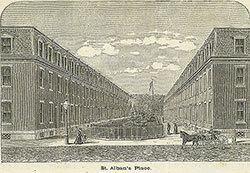 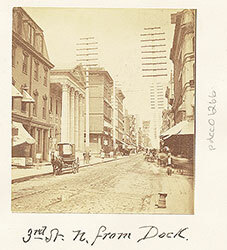 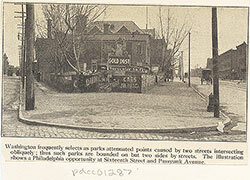 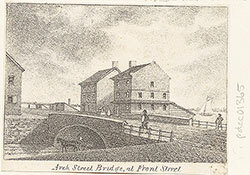 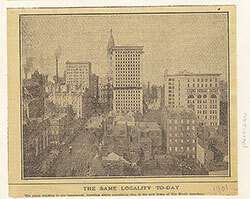 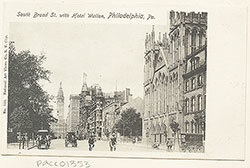 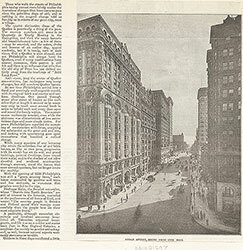 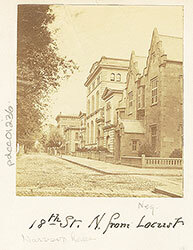 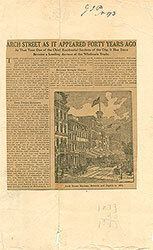 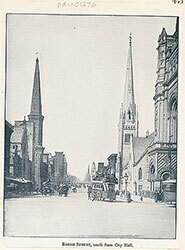 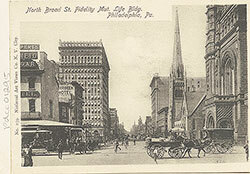 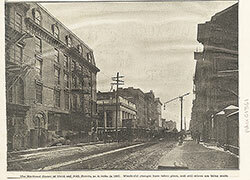 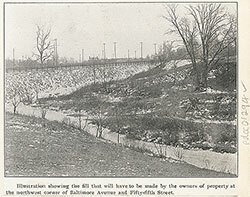 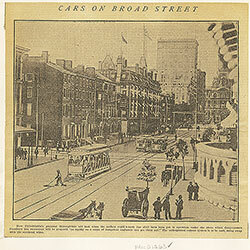 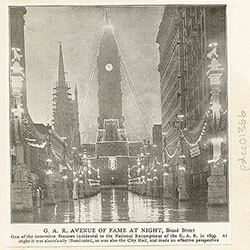 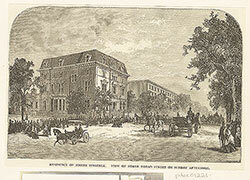 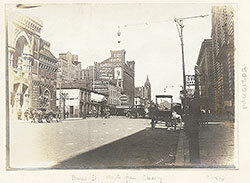 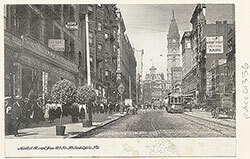 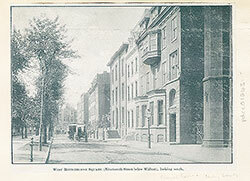 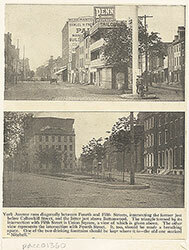 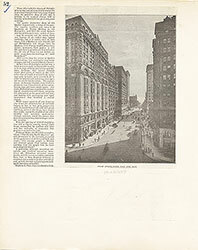 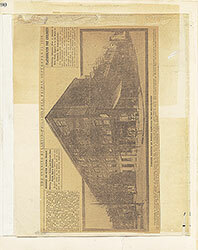 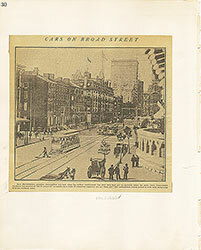 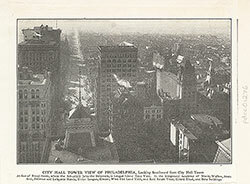 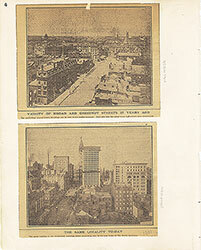 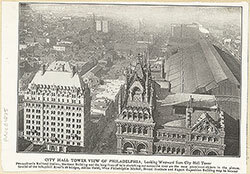 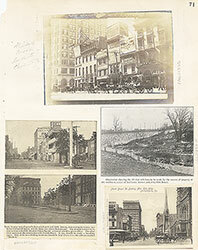 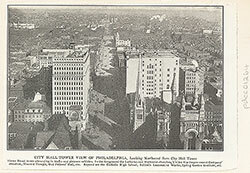 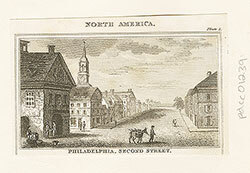 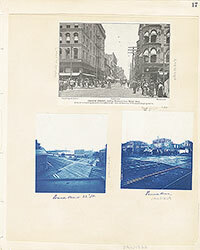 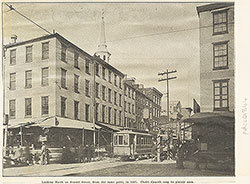 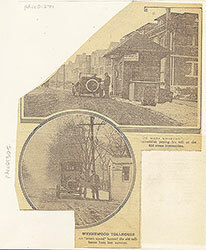 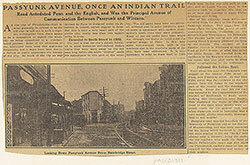 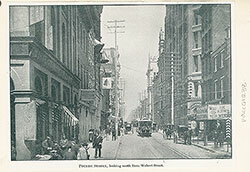 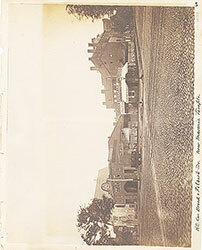 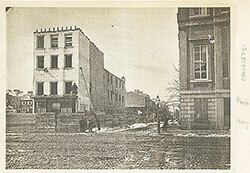 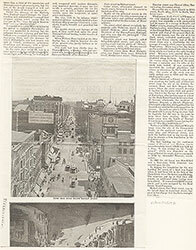 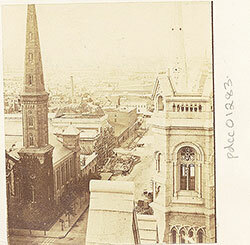 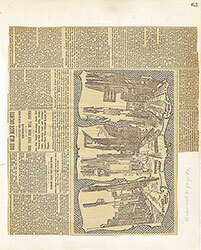 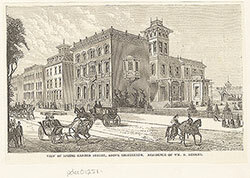 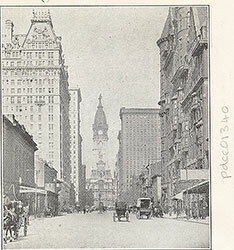 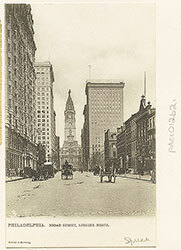 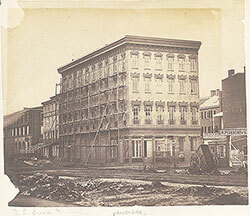 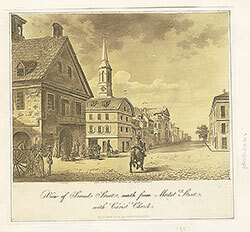 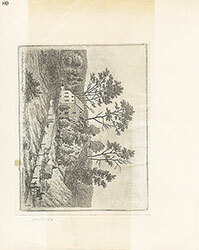 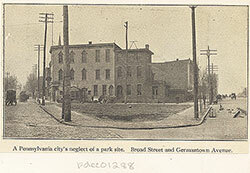 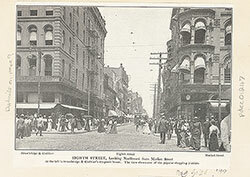 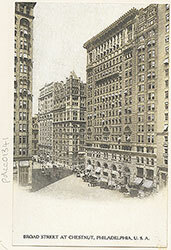 Caption reads: Showing the north side between Sixth and Seventh Streets. 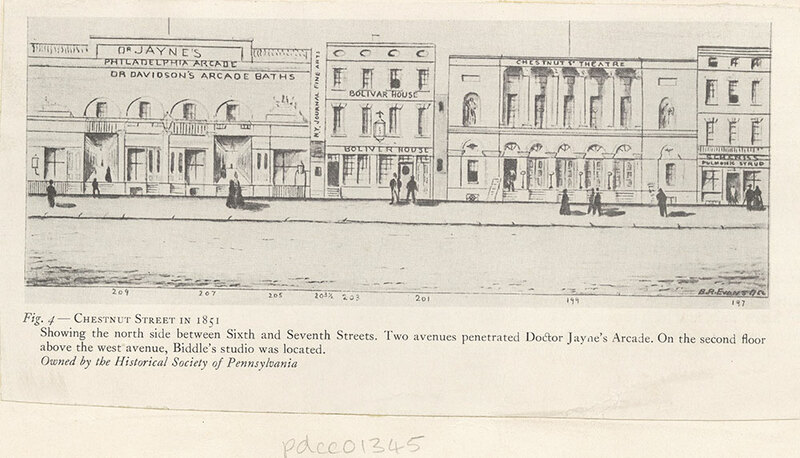 Two avenues penetrated Doctor Jayne's Arcade. 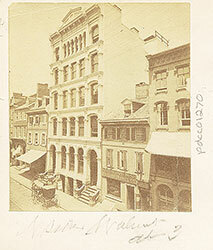 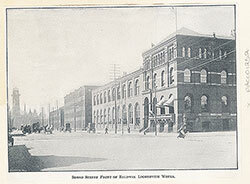 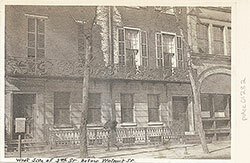 On the second floor above the west avenue, Biddle's studio was located. 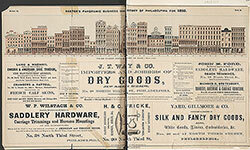 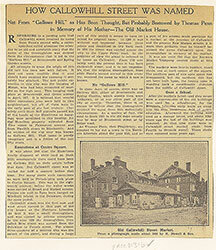 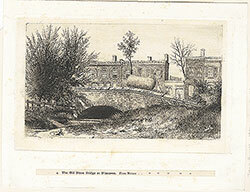 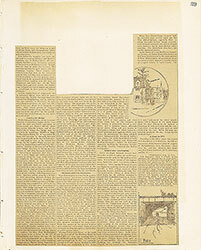 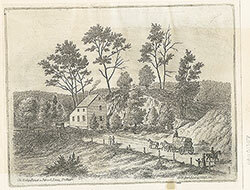 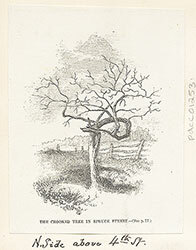 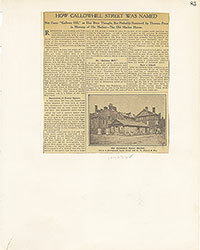 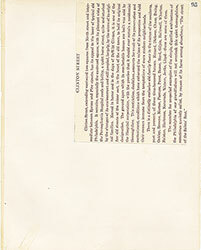 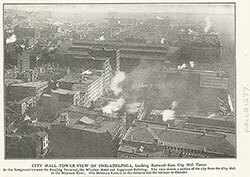 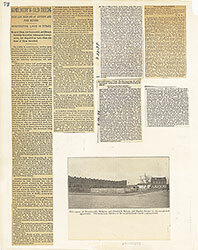 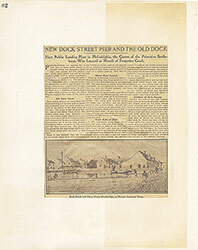 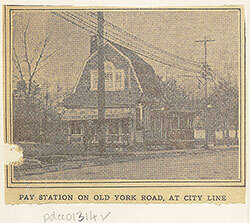 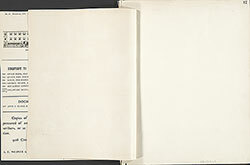 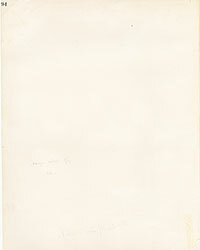 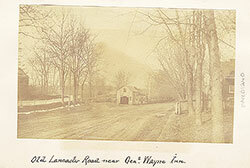 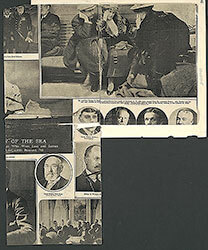 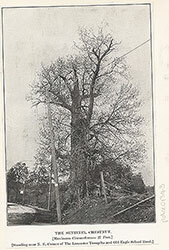 Original owned by the Historical Society of Pennsylvania.